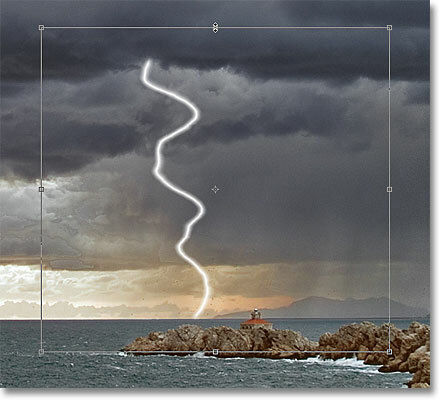 In this Photoshop effects tutorial, we'll learn how to easily create and add lightning to an image with Photoshop! 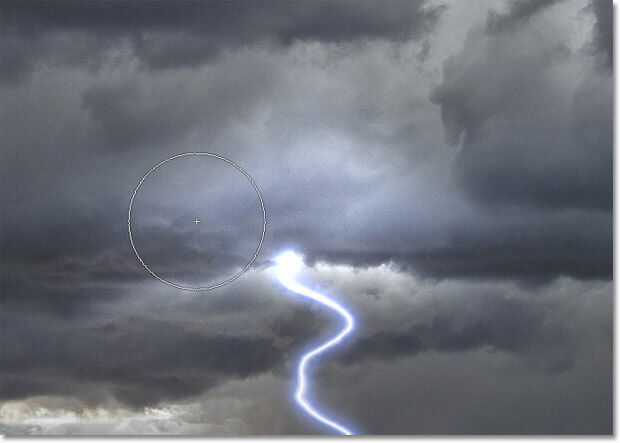 There's a few different ways to create lightning using Photoshop. The way we'll learn here is my favorite because, unlike real lightning in nature, this technique gives us lots of control over where the lightning appears and what it looks like in our image. After we've created the initial lightning bolt, we'll learn how to colorize it and how to brighten things up with some highlights to complete the effect! I'll be using Photoshop CS5 throughout this tutorial but there's nothing we'll be doing that's specific to CS5 so any recent version of Photoshop will work. Photoshop automatically names the new layer "Layer 1". 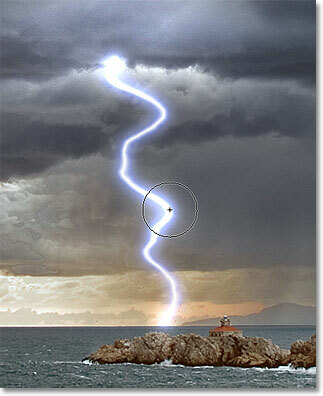 Draw a selection around the general area where the lightning bolt will appear. The selected area is now filled with solid white. Make sure the Foreground color (top left swatch) is set to black. Click on any round, hard edge brush to select it. 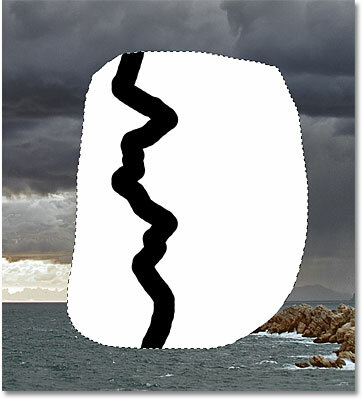 Use a small brush to paint a jagged stroke through the selection. 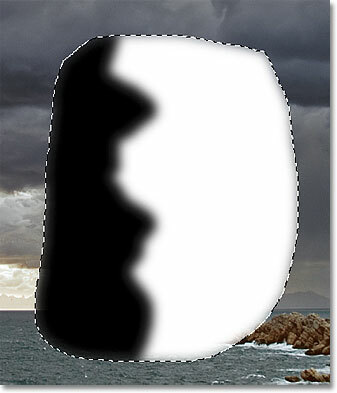 Paint over the area to the left of the stroke to fill it with black. Increase the Radius value to soften the edges of the black stroke. 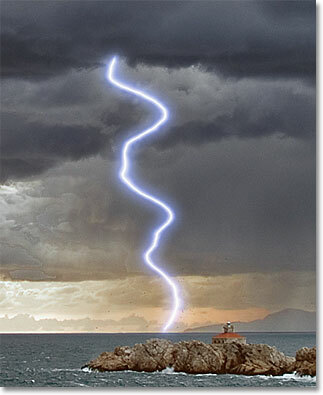 The soft edge of the stroke will soon become the lightning bolt. 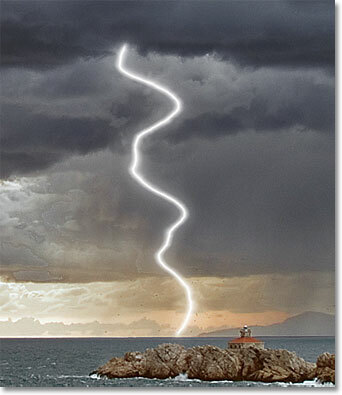 The lightning bolt begins to appear. 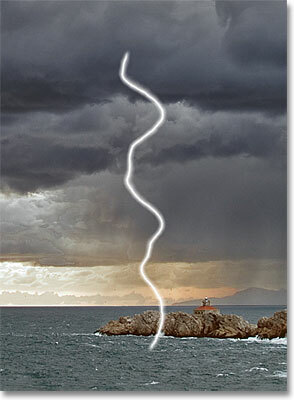 Inverting the image changes the lightning bolt from black to white. 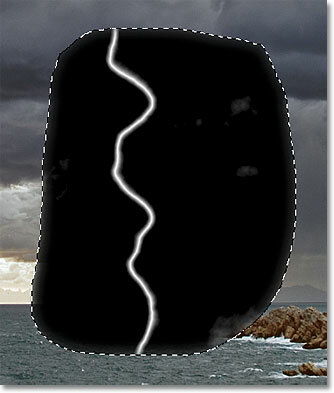 Drag the black slider towards the right to darken most of the area around the lightning bolt. Only a few gray areas remain around the lightning bolt. 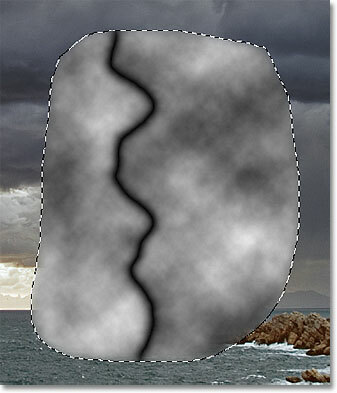 Drag the middle gray slider towards the right to darken the remaining gray areas. 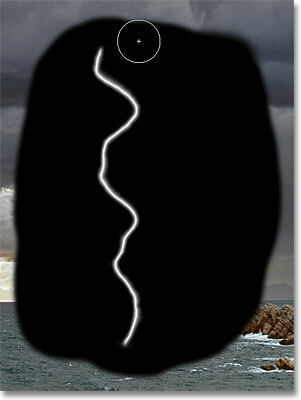 Most of the gray areas around the lightning bolt have now been darkened to black. Go to Select > Deselect to deselect the area. Lower the brush hardness to 50% to soften the edge. Clean up any remaining gray areas by painting over them with black. Paint over the transparent outer edges. Change the layer's blend mode from Normal to Screen. 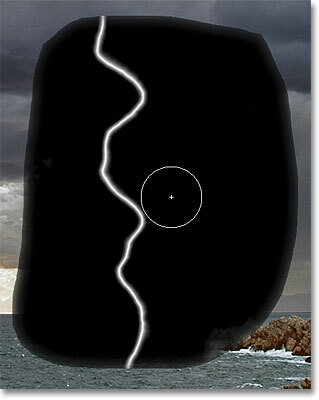 Only the lightning bolt remains visible on the layer. 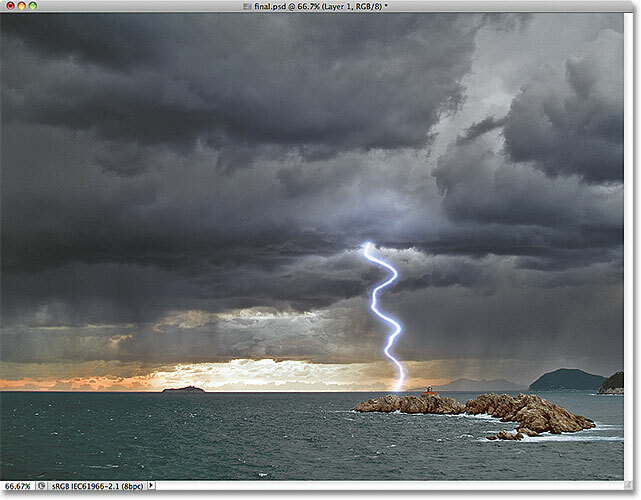 Use Free Transform to resize the lightning and move it into place. Photoshop names the new layer "Layer 1 copy". 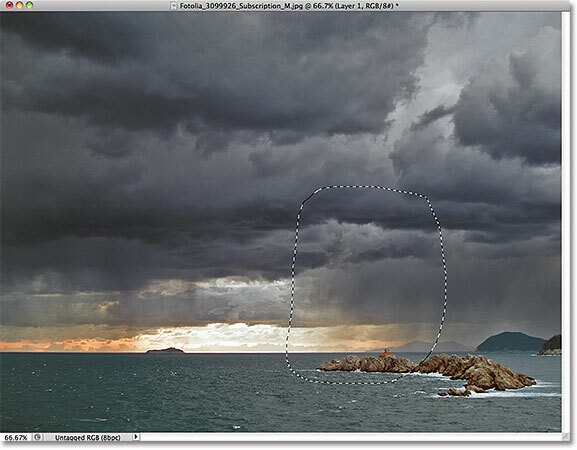 Drag the Radius slider to blur the copy of the lightning and create a blur effect. The lightning after adding a soft glow. 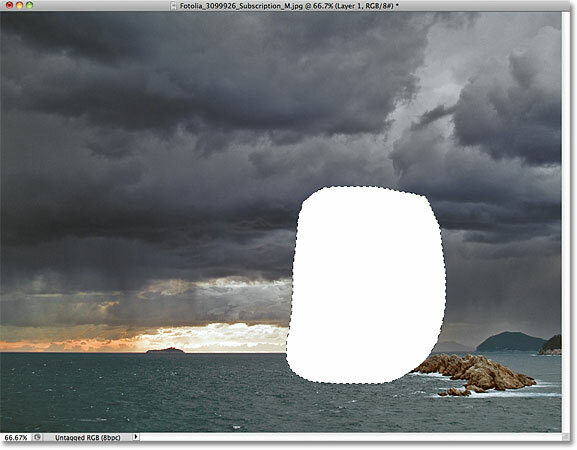 Duplicate the blurred layer to strengthen the glow effect, then lower the Opacity if needed to fine-tune the results. 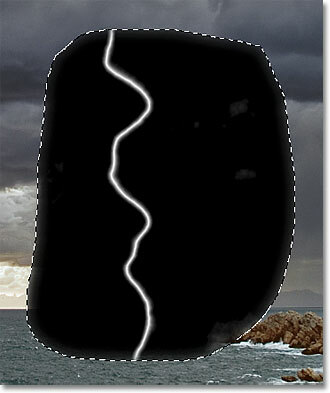 The effect after duplicating the blurred layer. Go to Layer > Merge Down, or press Ctrl+E (Win) / Command+E (Mac), then do the same thing again. The glow effect layers have been merged down with the lightning onto Layer 1. Go to Image > Adjustments > Hue/Saturation. Select the Colorize option, then choose a Hue and Saturation level. The lightning after giving it a bluish purple color. 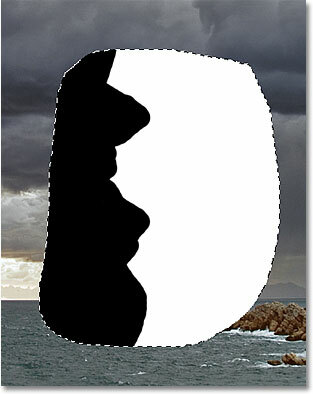 The two existing layers are merged onto a third layer. Set the options for the Dodge Tool in the Options Bar. Lower the edge hardness of the Dodge Tool to 0%. 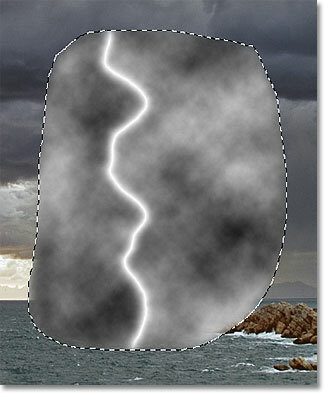 Painting with the Dodge Tool to brighten the clouds where the lightning begins. Clicking on a spot with the Dodge Tool sometimes works better than painting over it. Adding a couple of highlights along the lightning bolt itself. Lower the top layer's opacity if needed to reduce the highlights. 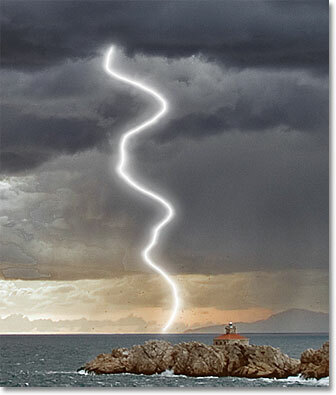 The final Photoshop lightning effect. And there we have it! 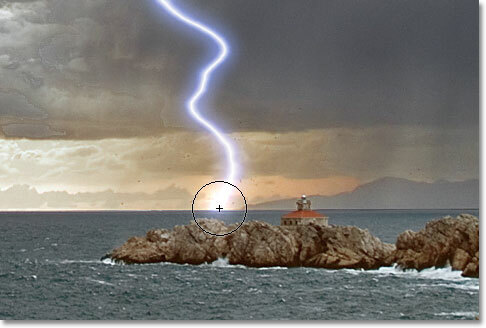 That's how to easily add lightning to an image with Photoshop! Visit our Photo Effects section for more Photoshop effects tutorials!